A health worker prepares to takes off protective clothing after visiting the isolation ward at Bikoro hospital, which received a new suspected Ebola case, in Bikoro, Democratic Republic of Congo, May 12, 2018. An outbreak of Ebola in the Democratic Republic of Congo has killed 19 people, according to the World Health Organization. A total of 39 cases have been reported in the northwestern Equateur province, the WHO said Monday. The infected include three health care workers. Congo's Ministry of Health and the WHO are tracing contacts of the victims and offering them an experimental Ebola vaccine. The WHO says the vaccine, called rVSV-ZEBOV, has been been tested in thousands of volunteers in Europe, Africa and the United States and was judged safe for humans. The virus, which causes a hemorrhagic fever, is spread by direct contact with the bodily fluids of an infected person or animal. On Sunday, a WHO delegation including the agency's director, Dr. Tedros Adhanom Gehbreyesus, visited the town of Bikoro, the center of the current outbreak. They said the Congolese government has reacted quickly to the crisis, but expressed concern about Bikoro's proximity to the provincial capital Mbandaka, a city of about one million people. 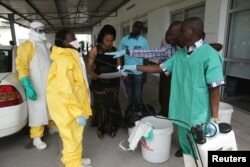 Congo has experienced several deadly Ebola outbreaks since the virus was first identified in the country in 1976. FILE - A health worker sprays a colleague with disinfectant during a training session for Congolese health workers to deal with Ebola virus in Kinshasa, Oct. 21, 2014. The current outbreak is unrelated to the one in Guinea, Liberia and Sierra Leone that killed more than 11,000 people in 2014 and 2015.